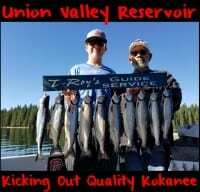 Recently, I wrote a blog on how to super charge Fire Corn to help catch more kokanee. However, I know many of you are purists and only want to cure your own corn, rather than using a pre-cured product. At times, prefer home-cured corn to tackle finicky kokanee. Fortunately, Pautzke produces product to cure your own corn. This way, you can have batches you’ve done yourself and some Fire Corn. 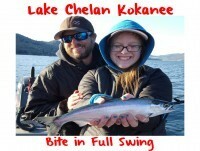 By following the steps below you can create your own perfect kokanee corn that’s firm, durable, colored, scented and a guaranteed kokanee catcher. All centers around a can of white shoe peg corn. It’s no secret that shoe peg is the choice for kokanee anglers everywhere. I like the Green Giant Steam Crisp. It’s firm and not over cooked. Grab a few colors of Fire Cure and Fire Dye. Meanwhile, I’ll be using my two favorites: pink and orange. Next you’ll need scents. I like Pautzke Red Nectar, Fire Powder (or Liquid Krill), garlic salt and canned tuna oil. Containers with good fitting lids are important, too. Open the can of corn and drain excess liquid. Once this is done dump the corn out onto paper towels. Spread it out so any remaining liquid is absorbed by the paper towels. Let your corn sit for 10-15 minutes to slightly dry. It will have a tacky feel to it once ready. Once the corn is ready, separate into two equal piles. Remember a little goes a long way. Lightly sprinkle Fire Cure onto the corn, dropping roughly one teaspoon on each pile. Don’t use more. It will burn the corn. After sprinkling on the Fire Cure lightly roll the corn around to spread the cure. After applying Fire Cure add desired dry/powdered scents. For the purpose of this blog I’m using the two that work best for me: garlic salt on the orange corn and Fire Power on the pink. Lightly sprinkle scent onto each pile and roll it around to get an even coating. I use about a teaspoon of each scent per pile of corn. At this point I remove the curing corn from the paper towels and place it in containers that have good fitting lids. I do this because in the next step it’s time for Fire Dye. Add Fire Dye. Fire Cure (which has been used already) has coloring. 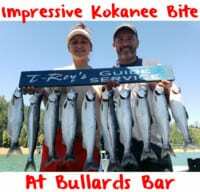 On the other hand, Fire Dye boasts stronger vibrant colors and is enhanced with UV, which is vital in the kokanee world. I add 20 drops of each color Fire Dye into the corresponding container of corn. Tighten lid and shake the corn to spread the Fire Dye. Liquid scents are important curing corn. It aims at diluting the Fire Cure and powdered scents, yet absorbs the cure and scent into the corn. While sometimes I use other scents, this time I’m again using two of my favorites: Pautzke Red Nectar and oil packed tuna. Open the tuna and drain the oil into the container (I added it to the orange corn with garlic). Now add Red Nectar into the pink corn. A 1/4 bottle will do. Apply the lids and shake. Place in the fridge for your next fishing trip. Editor’s Note: Veteran guide Sam Baird operates Slammin Salmon Guide Service. 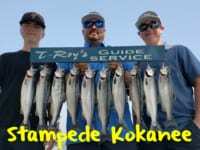 For more information on his kokanee trips or to reach him with questions please visit https://www.facebook.com/SlamminSalmonGuideService.